What Kind of Bears Live in Yosemite? 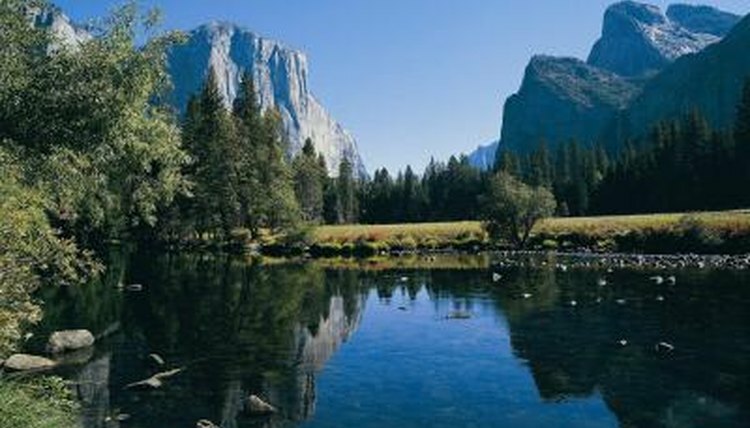 With its lush Sierra Nevada terrain, Yosemite National Park in California is home to more than 400 species of mammals, fish, reptiles, birds and amphibians. One species of bear frolics among the park's peaks, valleys and coniferous forests. But it's not the bear you'd expect by looking at the flag of the Golden State. Between 300 and 500 black bears are estimated to live in Yosemite National Park. The black bear is a species and not a color. Most range from brown to even reddish or golden brown. In fact, black bears that are actually black in color are rare in the Southwest. Weighing 200 to 350 pounds -- though a record-breaker in Yosemite weighed in at 690 pounds -- the bears in Yosemite feast on a diet of termites, grass, berries, acorns and other finds. When in their fall pre-hibernation mode, the bears will stuff themselves on up to 20,000 calories per day. What Happened to the Grizzly? Though the grizzly bear marches proudly across the California Republic flag, bears were hunted to extinction in the state in the early 20th century. A key reason why the black bear survived migration of humans to the state is its habitat adaptability: While Yosemite's black bears happily flourish in the forest, the grizzlies preferred the valleys and coastal plains that were developed into cities and farmland. Grizzly populations remain in the northern part of the continent. Of the 1,000 estimated grizzlies in the United States, none are native to California. Where you'll find Yosemite's bears depends on the season. In the wintertime, black bears, fat on their autumn acorn feast, look for a good place to hibernate. That can be a cave or a nook in a rocky outcrop, in a hollow tree or underneath a tree's thick roots, among other places. They may emerge from these dens once in while before the frost thaws. Come spring, the bears will go where the food is. At first this is usually grasses in the meadows, but when berries start to ripen it's buffet time. Yosemite visitors should always be on guard for bears and watch their speeds on the park's roads. Unfortunately, one to two dozen bears are killed or maimed annually here from because of contact with cars. About 4 million visitors stream through Yosemite's roads and trails each year, yet no one has been the victim of a deadly or serious bear attack in the park. Visitors are reminded to keep at least 300 feet from a bear if possible and to ward off curious bears by making lots of noise. Never put yourself between a bear and her cubs or a bear and food. And if that means your food, let the bear keep what he's taken. Properly secure food to avoid luring hungry bears into human habitat; members of the park's bear management team do patrol and give warnings or impound food that poses a safety hazard. Officials appreciate the public's help in keeping track of the park's bears. If you see or come face-to-face with one, tell a park ranger or call Yosemite's bear hotline at (209) 372-0322. Are There Bears in the Smoky Mountains?